Born at Winnipeg on 6 March 1920, son of Alphonse-Louis Monnin and Adèle Sperisen, he was educated at Ecole Provencher and St. Boniface College (BA, 1939). During the Second World War, he served three years overseas with the Canadian infantry, participating in the 1944 D-Day invasion of Europe. He later returned to Manitoba and, in 1946, graduated with a law degree from the Manitoba Law School. He was called to the Manitoba Bar in 1946 and practiced law for over 10 years with the firm of Monnin, Grafton, Deniset, Dowhan and Muldoon. He was appointed a Queen’s Counsel in 1957, the same year that he was became a judge to the Manitoba Court of Queen’s Bench. 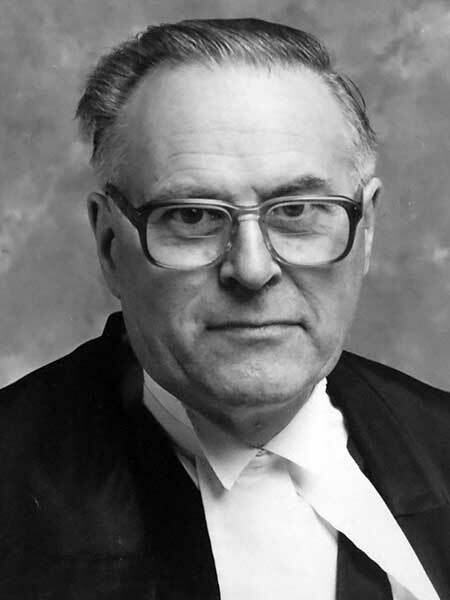 He served there until January 1962 when he was elevated to the Manitoba Court of Appeal to replace G. E. Tritschler, serving there until 1990. He was also Chief Justice for the Court of Appeal from 1983 to 1990. During his years as a judge, Monnin was known for his “clear, concise and rigorous decisions.” He retired from the bench in 1990. He chaired the School Divisions Boundaries Commission and the Federal Electoral Ridings Redistribution Commission. In 1998, he chaired the Inquiry Commission on Electoral Practices to investigate allegations that, during the 1995 provincial election, the Manitoba Conservative Party had financed candidates in a third party to split the vote and thereby ensure their election. Active in many community organizations, he was President of the Winnipeg Symphony Orchestra, Chairman of the Dominion Drama Festival (1962), and Chairman of the advisory board of St. Boniface College, Tache College, and the St. Boniface Sanatorium. He was Administrator of the Vanier Institute of the Family, President of the St. Boniface Historical Society, and was founding President of the Canadian Catholic Organization for Development and Peace, and Vice-President of the Manitoba Centennial Corporation and the Manitoba Centenial Culture Centre. He oversaw three major building projects: the reconstruction of the St. Boniface Cathedral after the fire in 1968, the construction of the Centre culturel franco-manitobain (as its founding President) in 1970, and the construction of the Education Pavilion at St. Boniface College. In recognition of his exemplary community service, Monnin was inducted into the Order of Canada (1991) and Order of Manitoba (2000). He was also given a Manitoba Golden Boy Award (1967), and he received honorary doctorates from the University of Winnipeg (1972), University of Ottawa (1972), Laval University (1974), and University of Manitoba (1979). He was appointed a member of the L’Orde des francophones d’Amerique (1979) and an Officer of the French Legion of Honour. He received the Queen Elizabeth II Silver Jubilee Medal (1977), the Queen Elizabeth II Golden Jubilee Medal (2002), and the Queen Elizabeth II Diamond Jubilee Medal (2012). He died at Winnipeg on 29 November 2013. “They helped make a better province,” Winnipeg Free Press, 6 November 1967. “Give us more ‘controversial’ judges like Monnin,” Winnipeg Free Press, 27 November 1989, page 7. “Jurist a veteran of D-Day,” Winnipeg Free Press, 30 November 2013, page B2. Obituary, Winnipeg Free Press, 4 December 2013. We thank Michel Monnin for providing additional information used here.